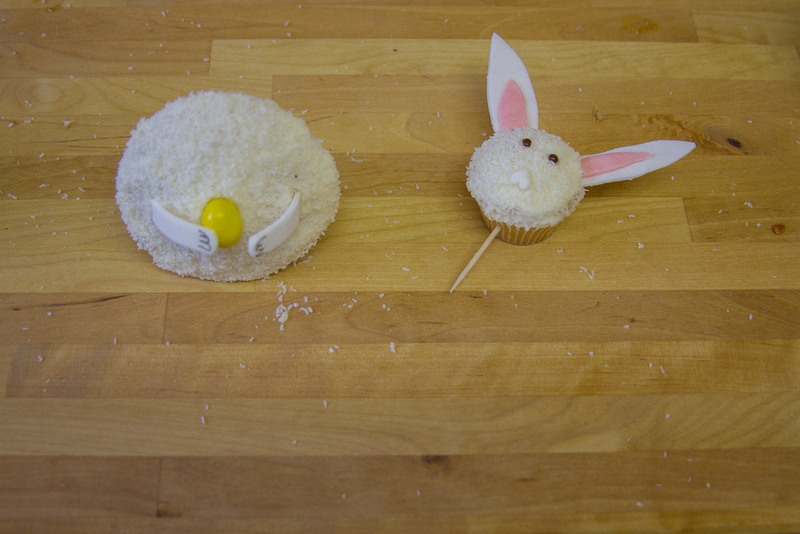 Again, Easter approaches far too early for me. What is it with holidays that they all of a sudden come around the corner and stand before me without having enough time to prepare? 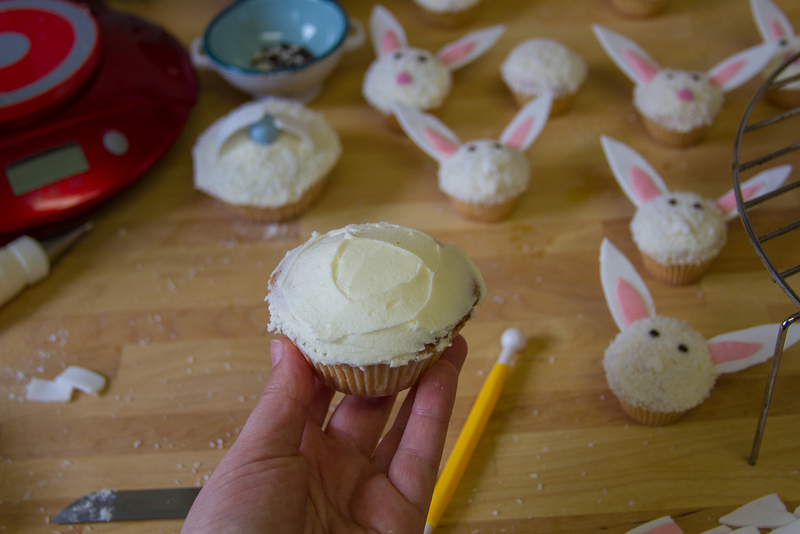 Well, luckily I was able to create these little Easter Bunnies just in time to share them with you and maybe to inspire you to make some Easter bunny cupcakes yourself? 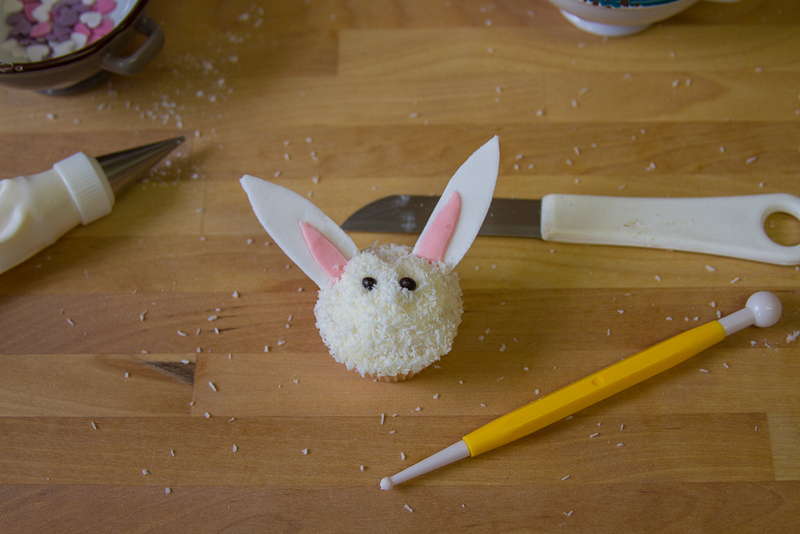 😉 Last year I was making a traditional Easter Lamb for the Easter breakfast table, so this year I wanted to try something else. 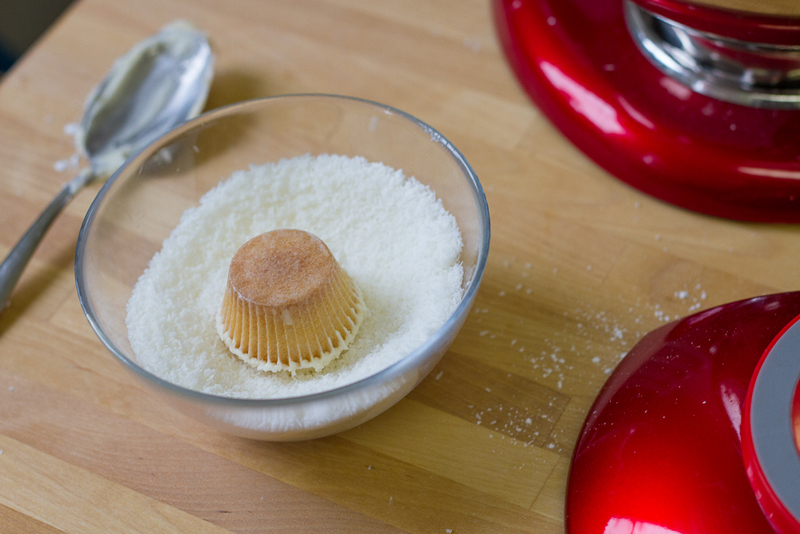 Making cupcakes has the great opportunity to give them away to friends and relatives. You could easily wrap them up nicely in some packages and decorate them with a nice printable or some ribbons and they would make a nice little Easter gift. 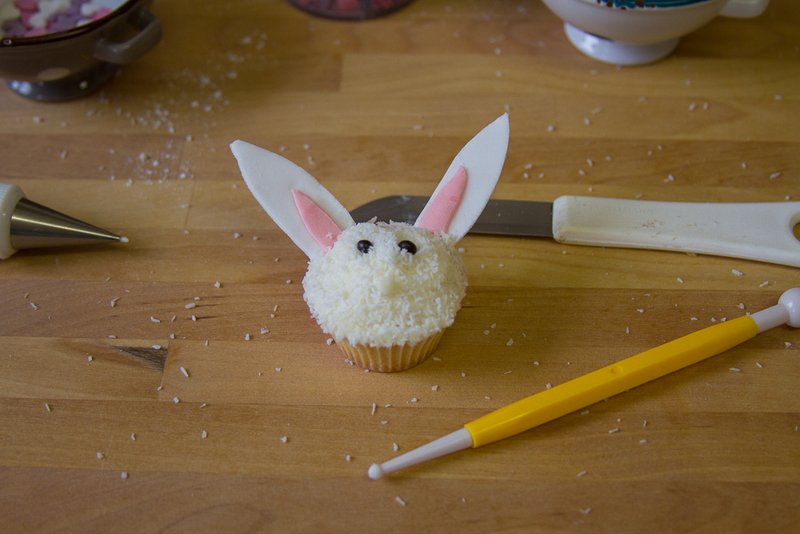 I started the day before baking the cupcakes by preparing the ears and the arms of the Easter Bunny. You can see that I am not a professional nor having any professional material at hand as to my surprise I didn’t own a round cookie cutter? So I have made a paper template and cut out all the ears by hand. 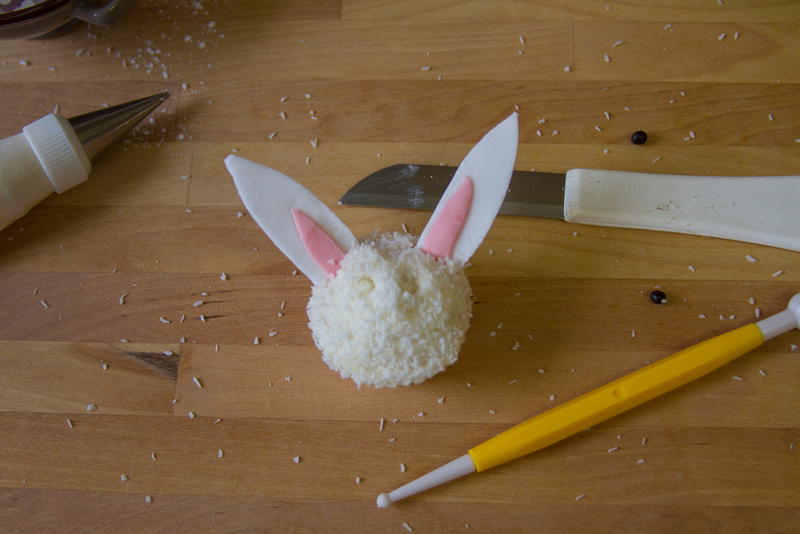 The first few ears took me quite some time as I wanted them to be perfect but working with a paper template is not the easiest thing to do 😛 After some time I quit to be honest as I was thinking Real Bunnies don’t all look the same, why should my Easter Cupcakes Bunnies? If you think different (and you probably do) of course you can make perfectly shaped ears! 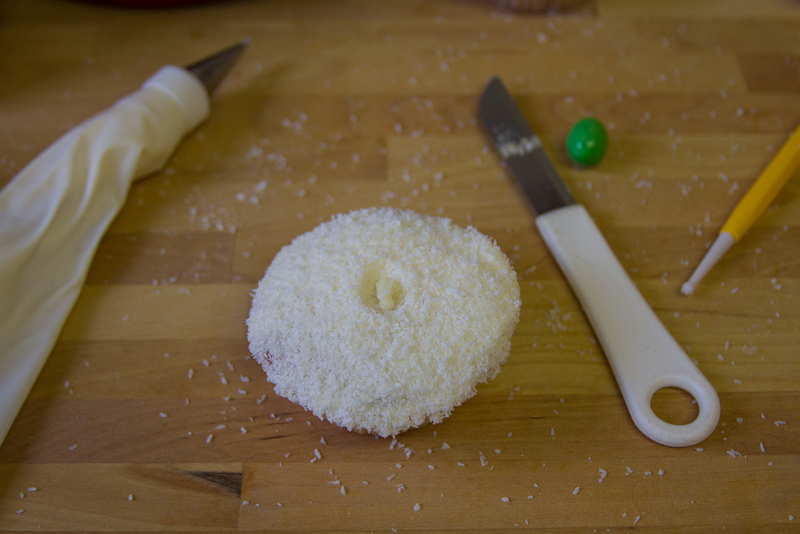 Round cookie cutters will definitely come on my list now as well… Anyway, I also colored some white fondant with food coloring to gain a pink color for the inner part of the ears. 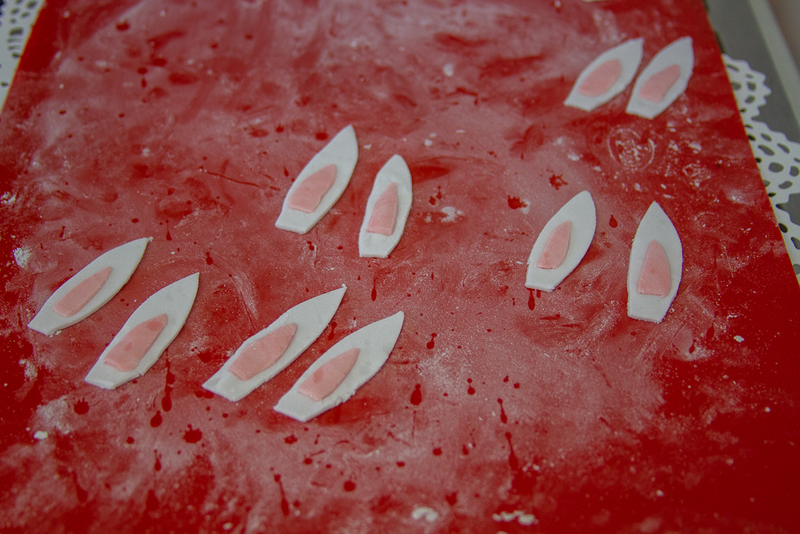 After rolling the fondant out I went all free-hand again to cut out the smaller pink inner ear parts. You can see I was cutting them hand-free, but actually I got quite fast with that technique 😛 Apply the pink fondant pieces by brushing a little water on to them (not too much!) and press them firmly onto the white bigger ears. 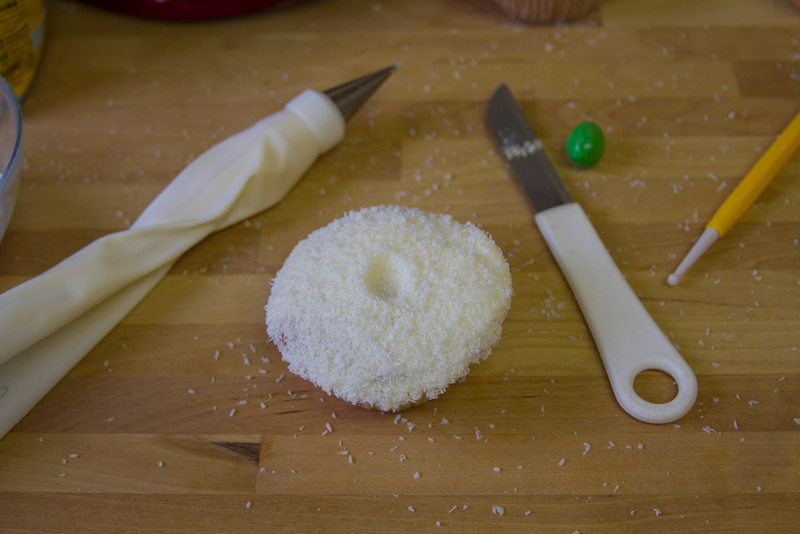 For the arms I just cut out long strokes of white fondant and rounded one end by using a piping tip „the wrong way“ 😛 I let them dry on some glasses covered with icing sugar, to prevent the fondant to stick to the glass. I let everything dry overnight. 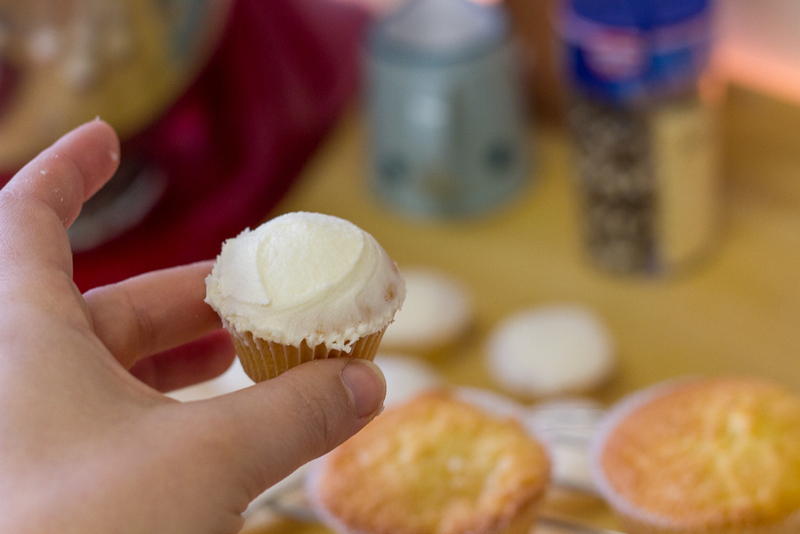 The next day I baked the cupcakes and after cooling I made a vanilla frosting and applied it to the small and big cupcakes. 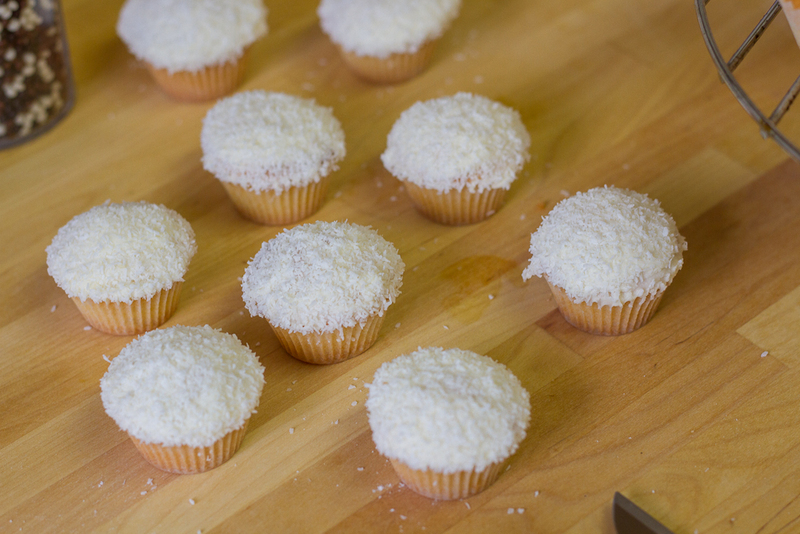 Press the cupcakes into some coconut flakes and start assembling the head. 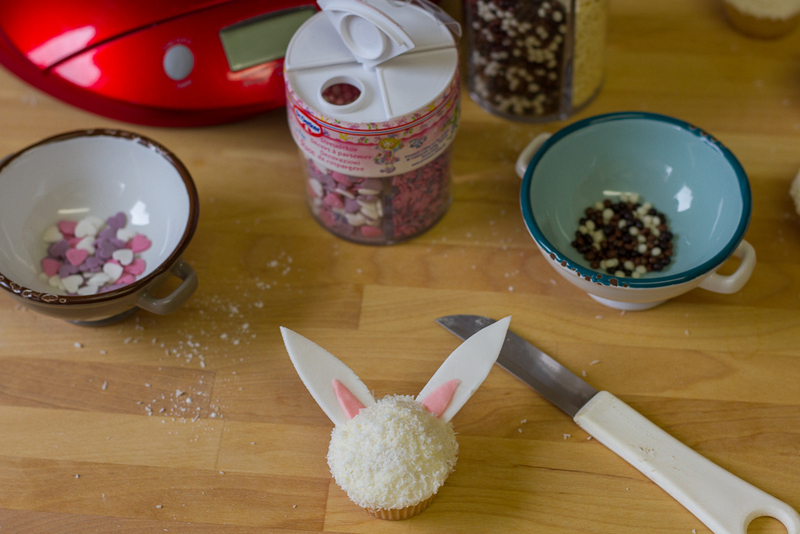 I started with the ears and that took me quite some practice as I broke the first 4 ears 🙁 So be gentle when inserting the ears into the cupcake!! 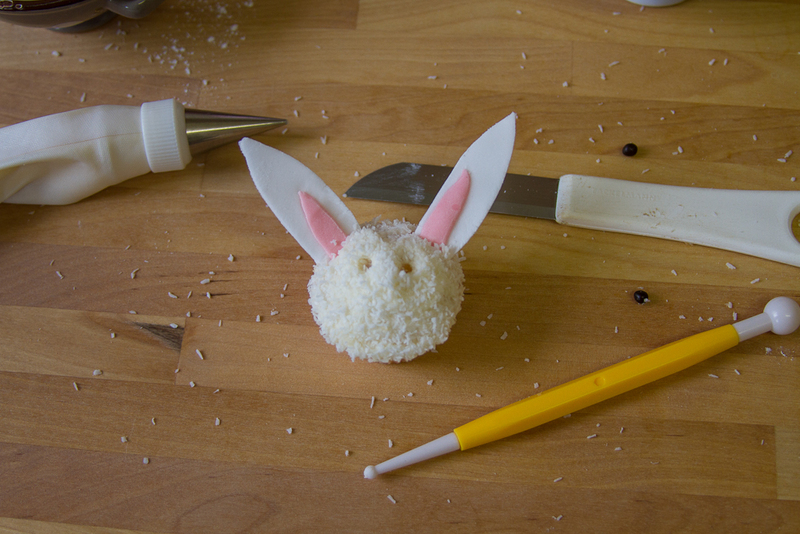 Also, use a knife the same width as the ears and make sure you cut deep enough. It helps when you wiggle the knife a little bit to broaden the gap. 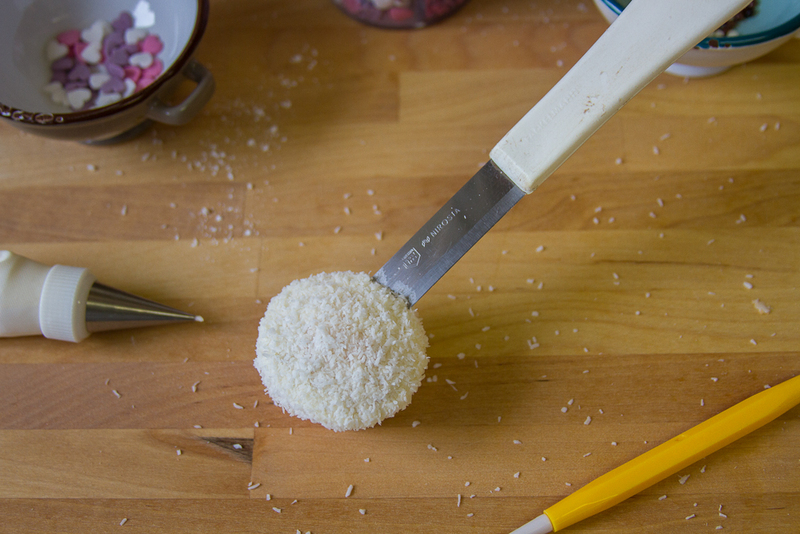 Believe me it makes a huge difference and makes your life so much easier 😉 Gently insert the ears and press the icing-coconut down to hide the cut. With a ball tool mark the spots where the eyes will be settled. Apply a bit of the frosting and press the two eyes (I used round chocolate sprinkles, feel free to use fondant or whatever you prefer) onto the frosting. Do the same for the nose. I used white and pink hearts up side down. If you want to can paint some whiskers onto the hearts by using a food pen. 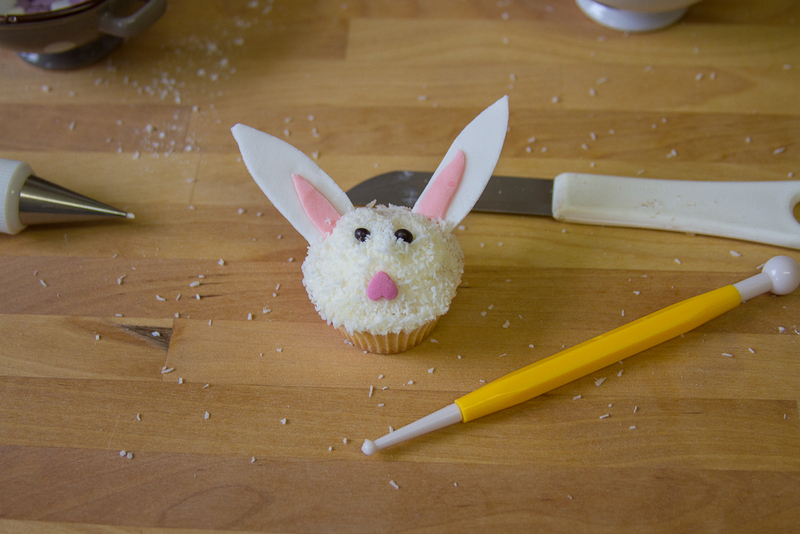 Now your head is ready and you can go on with the body of the Easter Bunny. 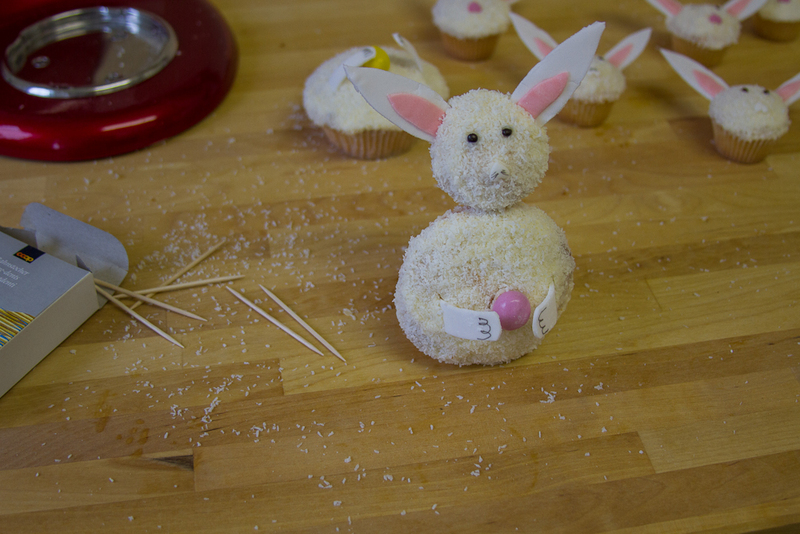 The Bunny is holding an Easter egg in front of his belly. I was using some Easter M&Ms as the colors were nice and the shape is just perfect! 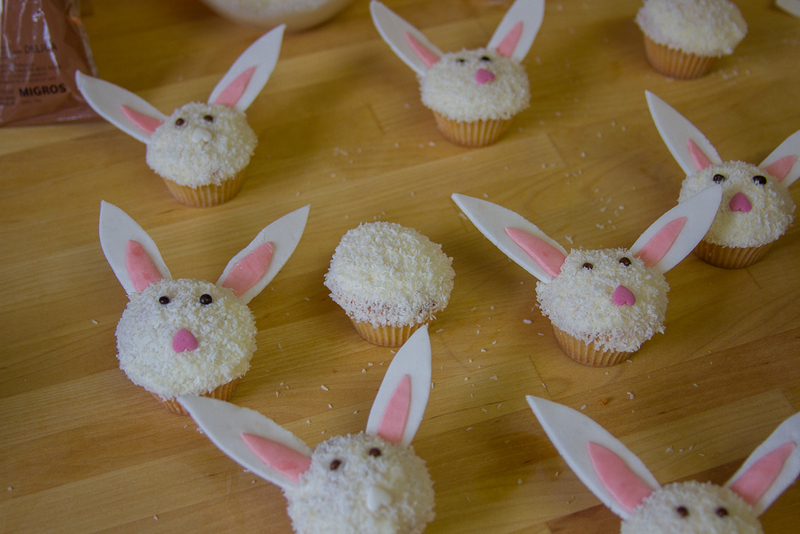 I was first thinking about chocolate Easter eggs, but was afraid they could melt/would be too heavy/wouldn’t stick to the cupcakes. 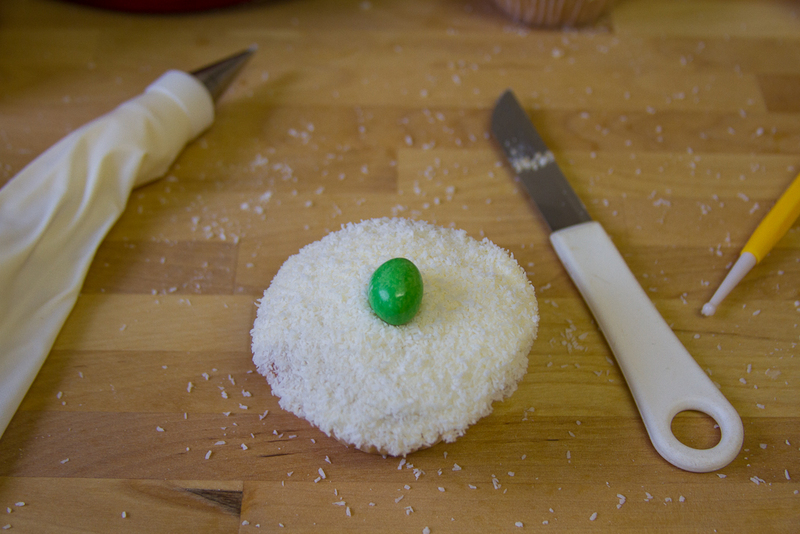 Using the M&Ms actually worked quite well 😉 Apply the egg by first pressing it down in the middle of the cupcake to mark the spot and than add some frosting and press the egg firmly down. Secure the arms in just the same way as you did with the ears. 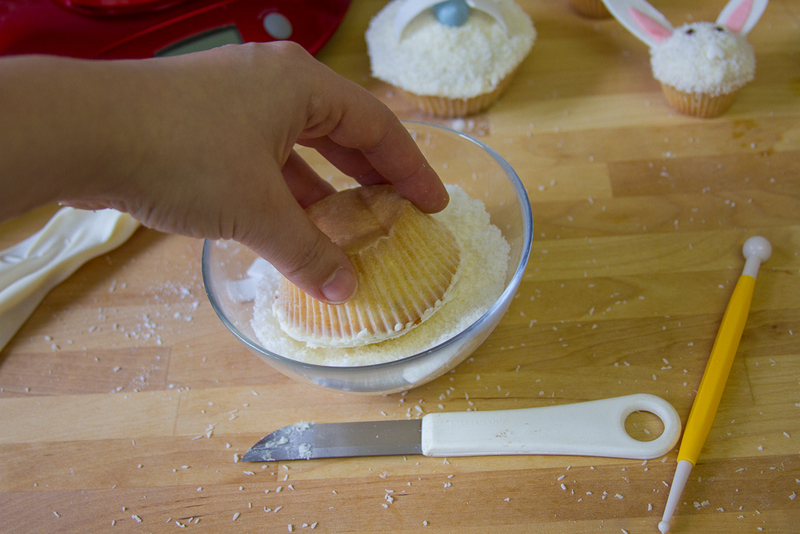 Make a deep cut into the cupcake, wiggle a bit to broaden the cut and gently insert the arms! 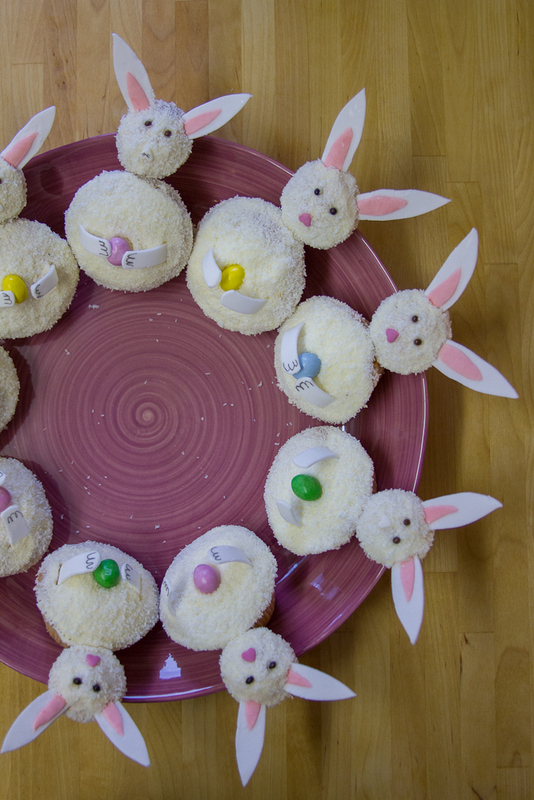 die osterbunnies sind auch echt zuckersüß!